Computer print on transparency, Dutch envelope. Edition of 19. 20 x 25 x 27 cm. 250 plus p + p.
Printed with light resistant inks however it is best not to position this in direct sunlight. The onna-bugeisha was a female warrior in the Japanese upper class who was a member of the bushi (samurai) class in feudal Japan. They were trained in the use of weapons to protect their household, family, and honor in times of war. They are sometimes mistakenly referred to as female samurai but they existed before the emergence of the Samurai class as well as having status aside from combat or war. For example, Empress Jingu (c. 169-269 AD), utilized her skills to inspire economic and social change. She is reknown as the onna bugeisha who, according to legend, led an invasion of Korea in 200 AD without shedding a drop of blood. 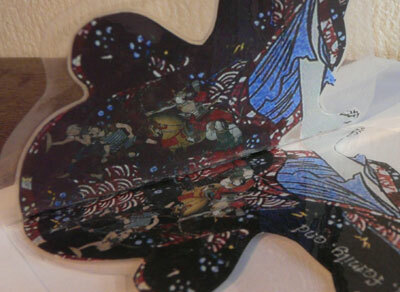 This 'pop-up' out of HERstory is an adaption of a 16th century illustration of Ishi-jo wielding a naginata, by Kuniyoshi Utagawa. 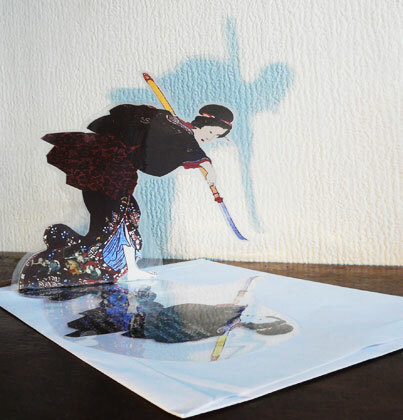 We created this work as a feminist response to a show entitled "Samurai Heroes" were the presence of females was forgotten about. 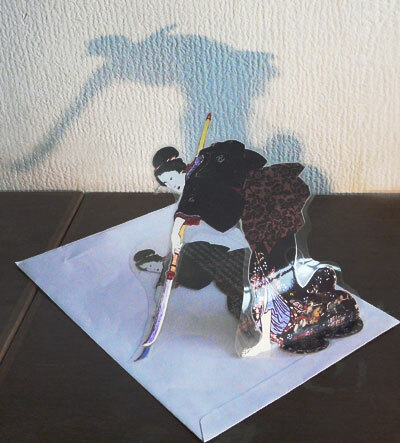 A 16th century illustration of samurai (Story of Night Attack on Yoshitsune's Residence At Horikawa) was embedded into the pattern of her kimono, and the envelopes used as support and frame for the work were recycled envelopes bearing the old "TNT" logo, the name for the Dutch postal service between 1998 and 2011.